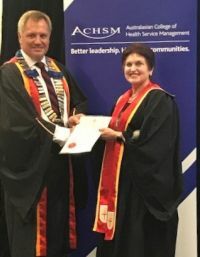 The work and achievements of The University of Tasmania’s Wendy Quinn (Lecturer in Health Systems, School of Medicine) was recognised with a Fellowship of the Australasian College of Health Service Management (ACHSM), presented in Darwin recently. Ms Quinn who coordinates the University’s Master of Leadership (Health and Human Services), said she was very honored to receive such an accolade. “I felt very proud but also very humble, given the amazing opportunities that I have had within Tasmania to develop a career in health service management over the last few decades,” she said. Acknowledging that leadership in health care and hospital management is a specialist skill, the assessment requirements for the ACHSM Fellowship are focussed on the applicant being able to demonstrate they have achieved the highest levels of skill, knowledge and experience in these areas. Fellowship represents an acknowledgement that an individual has expertise in health care leadership and hospital management along with a commitment to lifelong professional development. Ms Quinn, who has been with the University since 2011, said she owed a great debt to the many people who provided support and mentoring to her over the years. “My achievements have only been possible with the collaborative effort of so many others working in partnership throughout the years and I am deeply thankful and grateful,” she said. As a result of the increased recognition that the fellowship had provided, Ms Quinn said she was hoping to encourage leaders and managers in the health service system to increase their commitment to lifelong education through membership of ACHSM and also through postgraduate education with our leadership courses at the University of Tasmania.